Victorian Dollhouses and Victorian Doll House Parts website featuring Victorian Doll House parts and Kits for collectors and builders. 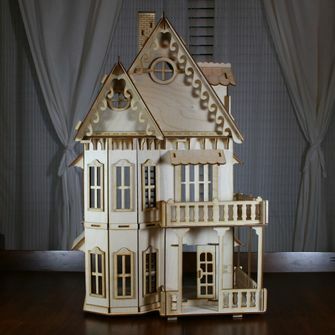 Dec 15, 2009 – http://WoodVictorianDollhouse.com continues to develop new concepts for Victorian Dollhouse builders with new products. The website launched earlier in 2009 and has provided collectors and builders worldwide with an online source to expand their creativity with our product line. Recently, WoodVictorianDollhouse.com had more than 200 products integrated into an upscale storefront window in NYC for the 2009 Holiday display. All parts are design and Made in the U.S.A. Each piece is cut from the highest quality 1/8” Baltic birch available. This helps ensure that our buyers will have a quality product, which will integrate into their Victorian Doll house project. It is very easy to seal for staining or to paint prior or after installation. The entire Victorian Dollhouse product line stretches over 19 unique categories and features nearly 150 unique products. The product line includes: Victorian Dollhouse Kits, Trim, Gables & Apex, Spandrels, Fretwork, Furniture, Trellis, Porch Spandrel, Screen Doors, Room Dividers, Ornamental Headers, Fence & Gates – All crafter with turn of the century Victorian architecture design. For additional information on the website launch, Laser Cut Crafts or CF National, Inc. please contact Chris Fialkowski or visit http://woodvictoriandollhouse.com. CF National, Inc. is a California Corporation with offices located in San Diego, CA. Since 2000 CF National, Inc. has provide consulting services to businesses in a variety of industries and vertical market segments. » Dollhouse Trim line doubles in Size - Literally! » Victorian Dollhouses and Victorian Doll House Parts website featuring Victorian Doll House parts and Kits for collectors and builders.